As the curtain for the 2019 general elections draws, several politicking for strategic positions in both chambers of the National Assembly is getting hotter and interesting. Though there seems to be an unwritten regulation that tends to cut off first timers in strategic leadership positions in the national Assembly, many pundits have continued to argue that the wisdom of King Solomon has nothing to do with the age of Methuselah. On this ground, political permutations and merit based analysis are beginning to hold sway as experts are now pushing for the policy of putting round pegs in round holes to avoid errors and failures in delivery of legislative intelligence and moving the nation forward after all. 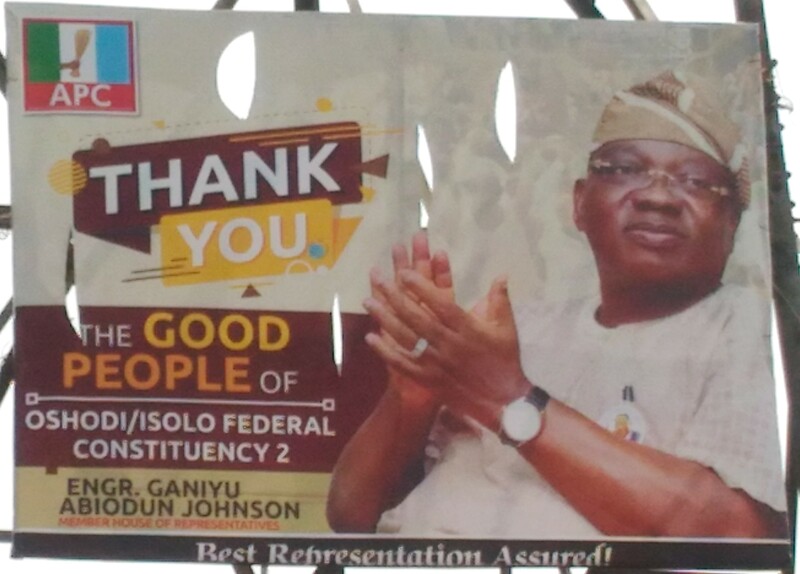 In this regard, many Nigerians that have followed the life and time of a Lagos Civil Engineer who had served almost every administration in the state since the return of democracy in Nigeria, Engineer Ganiyu Abiodun Johnson is a man, experts in built environment have been angling to chair the House Committee on Works and Infrastructure or the related Committee. Business Hilights gathered that Engineer Johnson, a true Lagosian moved to the prestigious University of Southern California, Los Angeles and came out with one of the best results in 1981. He joined the Federal Ministry of works and Housing as a principal Engineer in 1984 as an Engineer in charge of Bridge designs and supervision and from the principal Engineer cadre through assistant chief Engineer, Chief Engineer and assistant director, Head of construction in 1998. From 1998 to 1999, Engineer Johnson, having served at the Federal level with passion, dedication and power was lured by his state to come home for development and urban renewal contributions from his world class experience and performance. With the challenging appointment as the General Manager; New towns Development Authority (NTDA), he started with the task of actualising the planned internal reticulation of Lekki Phase 1 and opening up of Isheri North Scheme and other government Schemes which he handled with great success. Engr ganiyu Abiosun Johnson, new Federal House of Representative member, representing Oshodi/Isolo Federal Constituency 2, Lagos State. The height of his service moved the then government of Asiwaju Bola Ahmed Tinubu to make him an automatic member, Land use and Allocation Committee (LUAC). From July 1999, He became the General Manager; Public Works Bureau in-charge of general rehabilitation/Maintenance/Construction of over 300 roads across the state. Further assignments include the Replacement of Mechanical weigh Bridge to Electronic; capacity building of Bitumen storage tank from 75 metric tonnes to 200 metric tonnes and; installation of 500 KVA transformer dedicated to the Asphalt Plant and installation of 500 KVA Generator set. Before he became the special adviser to His Excellency, Babatunde Raji Fashola (SAN) in July 2007, he had, moved from the seat of the permanent Secretary, Public Works Bureau from 2000 to 2003 and Permanent Secretary; Office of infrastructure, Construction, Re-construction, Rehabilitation and Maintenance of roads from 2003 to early parts of 2007 when he was appointed SA to the then governor. Apart from several honours in his kitty, including those from Nigerian Society of Engineers (NSE) and Nigerian Institute of Civil Engineers (NICE), Engineer Ganiyu Johnson has been a member to several boards including those of LAMATA, State Tenders Board, Lagos Roads, Bridges and Highways. He had been the Chairman, Technical Committee Material Testing Laboratory. He is a member, American Society of Civil Engineers; Fellows to NSE, NICE; and institute of structural Engineers. He is married with children. A sportsman and a lover of rural community development as his activities in government have demonstrated throughout his stay at Lagos State Government Ministry of Works and Infrastructure. He served the earlier part of the current administration in Lagos State under Governor Akinwunmi Ambode and all his works and life, he has continued to display tact and tenacity in driving development activities in Works, Urban Development and Infrastructure. Many Nigerians who know Engineer Ganiyu Johnson are upbeat that he will do well heading the House of Representative Committee on Works and Infrastructure or any other related field so as to extend his tested professional competence to the entire nation.